In 1896 Strand Magazine boasted a feature on ‘dandy dogs’, focusing on the chic fashions that metropolitan canines were donning at the time. Imported from the finest boutiques in Paris these canine fashions were highly sought after in the Dogs Toilet Club in New Bond Street—a place where fashionable owners would go to decorate their pampered pets in the latest luxury wear. However, although dogs were the subjects of fashionable attire in this Strand article it was much more common that canines themselves were used as a fashionable object. With the rise of the dog fancy in the Victorian period dogs began adorning the arms of many affluent middle class owners as well as representing them in the show ring. Dog shows gave owners a chance to demonstrate the aesthetic excellence of their living accessories, who came to astutely represent their owner’s status, wealth, and own purity of breeding. In these developments the visual nature of the canine played a significant part in defining the fashionable elements of the canine fancy. Dandy dogs had to be displayed and seen in order to fully represent their owner’s status and visual culture was heavily incorporated as part of this process. My talk will explore the visual employment of the dog as a piece of living fashion in the Victorian period, proposing that the dog’s heavily developed class connotations helped make them a socially charged icon of contemporary Victorian fashions. This entry was posted in Uncategorized on July 20, 2015 by amypatriciarobson. As a ‘somaesthetic’ approach of beholding (re)gains currency the primacy of sight decreases (for example, in the re-evaluation of medieval artefacts that were touched, kissed and smelled). Alternatively, vision may at least be understood as opening haptic and experiential exchanges between object and maker, object and viewer. But perhaps the questionable pre-eminence of visuality also evidences an increased derogation of manual labour in lieu of what is perceived as more cerebral, more elevated from the yucky material of bodily production. New Voices 2015 takes place within the intellectual and creative space of the art school, the messy realm of art production. It therefore asks how (the) material and its associated places of production and ‘consumption’—from the studio to the gallery—can be integrated in the discourses of art history and its objects. This entry was posted in Uncategorized on May 25, 2015 by amypatriciarobson. When studying the role of the dog in Victorian art it is quite common to encounter little anecdotes and stories pertaining to an artist’s experiences, either with their own dog or a canine sitter of notable character. However none have come to be quite as distinct to me as those of James Yates Carrington and his companion, Teufel the terrier. James Yates Carrington and Teufel. The dog occupying these images was Carrington’s terrier Teufel, and the popularity of both artist and terrier rose significantly from that point onwards. In fact Teufel gained such attention that his escapades were regularly published in the Pall Mall Gazette (and other newspapers, which reproduced the articles with Carrington’s permission)[iii] and Carrington even endeavoured to write his own biography of Teufel’s life. The resulting book was titled Teufel the Terrier. Teufel the Terrier went on to be immensely popular and enjoyed multiple print runs. Some of the editions were meant as a luxury—bound in ‘handsome and substantial form and printed on specifically made paper’[v] as a Christmas present—whereas others became accessible for as little as one shilling. In addition to recounting tales from the life of Teufel, Carrington also used this book as an opportunity to provide the public with insights into how he worked and what the life of an animal painter might be like. Interestingly, in one encounter, with two potential American buyers, he listed the prices of two of his works as £40 and £150[vi] (higher than the prices of other popular canine artists of the time, such as Charles Burton Barber). Yet, had it not been for Teufel, James Yates Carrington may have never received the praise and public attention that be managed to muster at the time. This is something that Carrington himself admits in his canine biography. Born in April 1857, at Heathfield, Stockport, James Yates Carrington was the fourth son of Mr. Samuel Ratcliffe Carrington (the head of a firm of Stockport hat manufacturers). Carrington received his first lesson in painting from Mr. J.H.E. Partington and went on to study at the Academy of Fine Arts in Munich. However, at the time of purchasing Teufel Carrington was not an animal painter at all and, instead, had tried to establish himself as a landscape painter. Whether or not Carrington was truly so close to forsaking the arts altogether is not entirely certain; such a story makes for a good tale but it pays to be sceptical of such neat narratives. However, what cannot be denied is the significance that Teufel had in this decision and the success that came from it. Teufel sitting for his portrait. Through a shrewd business decision, a love of his dog, or (most likely) both Carrington defined his career that day, all on the basis of his interactions with his own canine companion. As as result Carrington’s career acts as a significant case study for the developing human/canine relations of the Victorian period; demonstrating a beneficial relationship between artist and dog, the dialogue of which became manifest through Carrington’s many artworks. Carrington’s own accounts of Teufel also indicate that his relationship with Teufel was a sincere and deeply caring one. Despite being named for the German word for devil (owing to his initial mischievous nature) Carrington speaks fondly of ‘Teuf’ throughout his canine biography. Further accounts in the book go on to describe how Teufel was both artistically inclined and the artistic inspiration for Carrington’s work. Teufel’s first taste of the fine arts. This perceived sharing of the arts between an owner and his dog not only makes for an interesting story today but also seemed to catch the public’s attention at the time, as the popularity of Teufel the Terrier and Carrington’s work demonstrates. In fact in 1891 Carrington was able to run an exhibit of artworks primarily dedicated to Teufel. Teufel next to some of Carrington’s artwork. The first part of this epitaph was repeated in the advertisement of Carrington’s Teufel exhibition, further authenticating the importance of Teufel to his owner’s artistic career and life as a whole. The advertisement for this auction (as well as the quote below) hints at a large body of work, in oils, watercolours, etchings, photographs, sketches, which makes me lament a little at the scarcity of Carrington’s work in museums, auctions, or even in an online search. Through the quantity of his work, his own writings, and the accounts of various newspapers, it is undeniable that the influence of Teufel on Carrington’s work was both significant and understood as being observably unique at the time. The relationship the two shared ultimately defined Carrington’s career while simultaneously winning over the public, propagating Teufel’s status as a canine celebrity. As such we should look to Carrington and his dog Teufel as a notable example of canine/human relationships in the field of Art History; someone who defined his life, his artwork, and the canine art and print market through the inseparable bond he had with his devilish terrier (with a bit of bull in him). [i] ‘Death of Mr. Yates Carrington’, Manchester Courier and Lancashire General Advertiser, Tuesday 3rd May, 1892. [ii] ‘An Animal Painter and His Models’, Pall Mall Gazette, Wednesday 26th May, 1886. [iii] ‘The Story of the Fisher-Dog’, The Sheffield and Rotherham Independent, Saturday 12th June, 1886. [iv] J. Yates Carrington & Charles Morley, Teufel the Terrier; Or the Life and Adventures of an Artist’s Dog, 1891, p. 2. [v] ‘Teufel the Terrier’, Pall Mall Gazette, Tuesday 18th November, 1890. [vi] Teufel the Terrier, 1891, p. 58. [vii] ‘Death of Mr. Yates Carrington’, Manchester Courier and Lancashire General Advertiser, Tuesday 3rd May, 1892. [viii] Teufel the Terrier, 1891, p. 25. [ix] ‘An Animal Painter and His Models’, Pall Mall Gazette, 1886. [x] Teufel the Terrier, 1891, Pp. 7-8. [xi] ‘Teufel’s First Taste of the Fine Arts’, The Graphic, Saturday 31st January, 1891. [xii] Teufel the Terrier, 1891, p. 12. [xiii] ‘Teufel the Terrier’, Manchester Courier and Lancashire General Advertiser, Friday 16th January 1891. [xiv] ‘To Every Lover of a Dog; The Late Mr. Yates Carrington’s Pictures’, Pall Mall Gazette, Saturday 28th May 1892. [xv] Teufel the Terrier, 1891, P.p. 41-43. [xvi] ‘Christmas Books’, The Graphic, Saturday 20th December, 1890. This entry was posted in Dog Related, Random Musings and tagged Animal Painters, Art History, Canine Mourning, Dog, Dog Art, Dog Protector, Dogs and the Art, Dogs in Art, Fox Terrier, J. Yates Carrington, James Yates Carrington, Teufel, Teufel the Terrier, Yates Carrington on April 5, 2015 by amypatriciarobson. Earlier this month I had the great pleasure of giving a short 10 minute presentation at the inaugural event for PUNCS: Plymouth University Nineteenth Century Studies. PUNCS is a fantastic new interdisciplinary forum through which researchers working on themes across the globe which speak to the long nineteenth-century can connect and discuss their research. In time PUNCS hopes to foster opportunities for collaboration and this was particularly apparent in the one-day conference event that I attended. The last panel in particular, which looked prevalently at the methods through which every day offences were reported between 1880 and 1920 demonstrated strong links between people’s research topics as well as the overall potential that collaborative projects hold. My own talk was titled ‘Canine Character: Reading the Dog in Victorian Visual Culture’ and briefly addressed some research points that have interested me recently. In particular I have been interested in exploring the impact of the dog fancy when it came to canine visuals and the notion of ‘reading’ a show dog for its aesthetic appeal. The impact of this move towards canine connoisseurship, I propose, had significant implications concerning how audiences consequently came to view dogs in imagery. The potential construction of a readable canine physiognomy and/or phrenology and the subsequent implications of such are of a particular interest to me. The rest of the talks were intellectually rich and impressively diverse, including a talk on the reception of Vasari’s Lives of the Artists in mid-Victorian Britain by Dr. Jenny Graham, a reading of Plymouth’s own Cottonian Collection by PhD researcher Susan Leedham, an exploration into the theme of Mercy by Dr. James Gregory, and some insights into the lives of the working-class female when it came to Mechanics’ Institutes in Victorian Britain by PhD Researcher Doug Watson. If you would like to know more about PUNCS then I encourage you to go and explore their site. No doubt there will be more engaging events upcoming. This entry was posted in Dog Related, Updates and tagged Canine Character, Conference Talk, Cv & Accomplishments, CV & Personal Accomplishments, Dog, Dogs, Doug Watson, James Gregory, Jenny Graham, Plymouth University, Plymouth University Nineteenth Century Studies, PUNCS, Susan Leedham on March 23, 2015 by amypatriciarobson. Theme: A Picture of Health: Representations and Imaginations of Wellbeing and Illness. Title: Class Contagions and Canine Culprits: Rapid Representations and the Middle Class Imagination in Victorian Britain. ‘Dogs and Dog Law’, All The Year Round, 1886, p. 426. During the Victorian period rabies (or hydrophobia, as it was known in humans) gained a lot of momentum in the imagination of the public. Media depictions were frequent, laws were passed, and people had many different ideas about what turned a dog mad. Yet despite public concerns regarding rabies, ‘mad dogs’, and the notorious ‘dog days’ of summer, there were very few incidents of confirmed rabies throughout the period. What, then, caused such avid fear and attention from the Victorian public? This talk will explore one of the factors. Looking at imagery representing rabies, this talk will propose that the middle classes feared rabies as more than just a disease. Instead rabies became viewed as a contagion—propagated by the lower and dangerous classes—which had the potential to attack and corrupt the wellbeing of middle class bodies, values and morals. This middle class imagination, it will be proposed, was reinforced by visual representations of rabies; which served to strengthen notions of mad dogs as violent, law-breaking, and dangerous curs of the streets rather than the afflicted and ailing animals that they were. The New Police Regulations of Dogs (Detail), The Graphic, 1885, p.697. This entry was posted in Dog Related and tagged AAH, AAH New Voices Conference, Cv & Accomplishments, CV & Personal Accomplishments, Dog, Dog Art, Dogs on March 23, 2015 by amypatriciarobson. Last month, to commemorate the end of Crufts, Cathrin Yarnell decided to showcase some of the V&A’s many dog-related prints, drawings and paintings. Her post, titled ‘Paw Prints‘, can be seen here and I recommend it to avid dog-lovers and canine art appreciators alike. Personally I was delighted to see that some of the canine motifs that my thesis will cover are presented in this doggy display. The dog mourner is readily shown with Landseer’s prominent The Old Shepherd’s Chief Mourner, while the dog as a saviour (in this case of children) is shown through the typically noble Newfoundland in a print simply titled The Newfoundland Dog. The rising popularity and diligence of dog portraiture is represented readily in the image of Rodney by Byran Edward Duppa. Yarnell is eager to point out that this portrait of Rodney “has been executed with all of the care of a human portrait”, a concept that shall be explored in my own work. The final print in Yarnell’s post does well to illustrate a range of canine motifs that were popular in Victorian Britain–The dog as saviour (or both man and child), the noble dog of the aristocracy, the dutiful and humble dog of the countryside, and the dog as comfort and aid to beggars, to name a few. It is nice to know that such motifs still capture people’s imagination even today. This entry was posted in Dog Related, Posts and tagged Art, Beggar's Dog, Dog, Dog Mourner, Dog Protector, Dog Related, Dog Saviour, Dogs, Paw Prints, The V&A, V&A, Victorian on June 9, 2014 by amypatriciarobson. 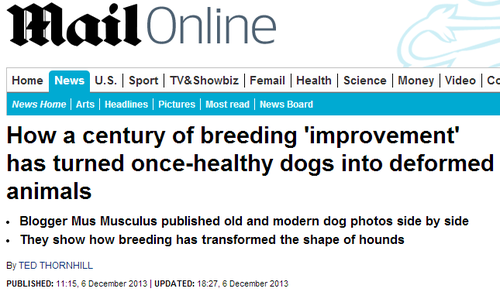 While it is outside of my current research scope, some of my readers might be interested in this recent article from the Daily Mail online concerning the differences in pedigree dogs from 1915 to our current canine companions. The original post that inspired this news can be found on the blog of Mus Musculus, PhD, titled Science of Dogs. He has also since revised that post, adding skull comparisons in addition to photographs. While the images in the blog post may be disturbing enough for some other bloggers have responded in kind to Musculus’ blog post, by posting some images of their own. One such blogger is Jemima Harrison, director of the BBC documentary Pedigree Dogs Exposed and owner of a blog of the same name. Looking at both the Daily Mail new report and the original blog posts, Jemima provides further examples of the Basset Hound, the German Shepherd, and the Dachshund in her own post. While some might find Jemima’s blog to be controversial, the comparisons brought to light (by Musculus’ posts, at least) show the troubling developments that have occurred to the breed standard of some dogs over the past 100 years. With such issues currently at the forefront of public concern, studies into the development and cultural treatment of the dog throughout history become all the more socially relevant. This entry was posted in Dog Related, Posts and tagged Daily Mail, Dog Breeding, Dog Fancy, Dog Related, Mus Musculus, Pedigree Dogs Exposed on June 9, 2014 by amypatriciarobson.